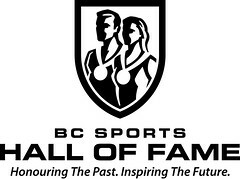 Today INTERNeX is happy to introduce our partner and summer party silver sponsor BC Sports Hall of Fame and Museum! See our Summer Party event page for more information on this event of summer 2012! Thank you, BCSHOF, for supporting this awesome event. Have you discovered Canadian ice hockey? Are you crazy about soccer? Or is it all about the Olympics for you? The BC Sports Hall of Fame and Museum informs you about these sports and many other athletic achievements and events in BC sports history. Founded in 1966, they preserve BC’s sport heritage, honor outstanding athletes, and exhibit distinct artifacts from the world of sports. Additionally, the museum and foundation try to inspire and encourages all British Columbians to pursue their dreams by telling success stories of BC athletes and managing programs like the Hero In You Education Program. Honouring the Past. Inspiring the Future is their vision and motto. The BC Sports Hall of Fame entertains and educates through many exciting and interactive exhibits. Steal a look into the BC Place Stadium through the viewing window or try out interactive games in the Participation Zone, such as climbing on the treadwall, running on the 14m track or kicking in the soccer simulator. Are you in the Olympic spirit? 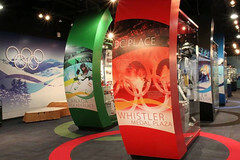 There is a new exhibit space dedicated to the artifacts and stories from the Vancouver 2010 Winter Games. Take a look at Olympic torches, medals, uniforms, gifts and equipment from teams all over the world. Each year a few outstanding sport talents who accomplished greatness and brought pride to British Columbia are selected to be honored by the BC Sports Hall of Fame. The Vancouver Canucks, Vancouver Whitecaps, BC Lions, and even some Olympic Teams are among them. The BC teams and athletes are from all kinds of sports: of course ice hockey, curling, or soccer, but also figure skating and horse racing, diving and canoeing, and many more. Learn about Canada’s and British Columbia’s sport history and extraordinary achievements of individuals and teams from your host country! 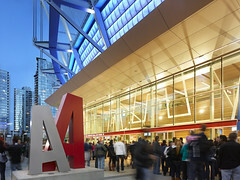 The BC Sports Hall of Fame is located at BC Place Stadium, right in the home of BC Lions and the Vancouver Whitecaps. Check out their website for more information: www.bcsportshalloffame.com. Join the INTERNeX Summer Party 2012 and win free tickets for this heart of BC sports! If you haven’t been to the Rockies – you haven’t been to Canada! Get the most out of your summer and experience one of the most spectacular places on earth! Join other travelers on a 4-day (3 night) tour to the heart of the Canadian Rockies and travel through some of the most awe inspiring scenery to be found anywhere in the world! Embark on a journey from Vancouver to Alberta to see towering peaks, frigid glaciers, and stunning lakes. Four days of breath taking scenery will give you memories to last a lifetime. Don’t have a friend? No problem – you’ll meet tons of people on this trip! For only $340.00 (taxes in! ), you won’t find a trip like this anywhere else! This trip begins July 30 and ends August 2, 2010. Whether you’re just out for an incredible sightseeing journey or you want to try your hand at a variety of fun activities, this tour has something to suit every taste. The PERFECT MIX of amazing adventures and stunning sightseeing! The hotel in Banff is The Mount Royal. It’s right in the centre of this beautiful mountain village. Step out the front doors of the hotel and you’re in the heart of the party – only seconds from the ragin’ nightclubs and pubs! Two of the three hotels have indoor pools with water slides and hot tubs. The fun is just starting when we arrive at our hotels! Free entrance to Banff’s best nightclubs! Daily guided sightseeing through some of the most incredible scenery in the world! End of tour PARTY at our Partner Camp! Marshmallow roast, songs, a roaring campfire and dozens of new friends. It just doesn’t get any better! Have a great time with your cool Canadian guide. Getting there is half the fun on the deluxe highway coach with games and movies while you make new friends. Hockey tournament in Valemount – Let the games begin as teams face off for a game of ball hockey! 3 nights of accommodation in Valemount, Banff and Golden. LAKE LOUISE. Visit the most famous lake in Canada and marvel at the unreal colour of the water framed by a stunning mountain backdrop! BANFF. The most famous, and popular, town in the Canadian Rockies. Take a boat cruise, soar to mountain peaks on a gondola, or just explore – Banff has so much to offer! The ICEFIELDS PARKWAY. This highway has often been described as the most beautiful highway in the world and it is a very fitting description! Glaciers, mountains, and pristine lakes are found all along this amazing stretch of unbelievable road! BOW LAKE. A beautiful mountain lake not to be missed. THE COLUMBIA ICEFIELDS. No trip to the Rockies is complete without taking a Snowcoach Ice Explorer tour out on to the glacier. Definitely a once in a lifetime thrill! ATHABASCA FALLS. Witness the thundering roar as the Athabasca River drops 23 m through layers of limestone! JASPER. Visit Banff’s little sister. Quieter and not as busy as Banff, Jasper is a gem waiting to be discovered. THOMPSON RIVER VIEWPOINT – Great views of the North Thompson River. LAC LE JEUNE PROVINCIAL PARK – We stop for a quick dip in this beautiful mountain lake or you have time to explore the beaches. A great place for a picnic lunch! MT. ROBSON. 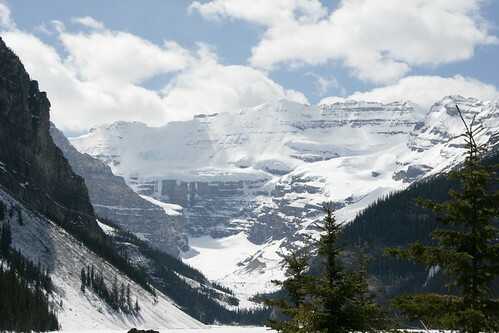 This is the highest mountain in the Canadian Rockies and offers stunning views on clear days. SPAHATS FALLS. One of the most dramatic falls in Western Canada! 5 NATIONAL PARKS, 1 PROVINCIAL PARK, 3 UNESCO World Heritage sights. 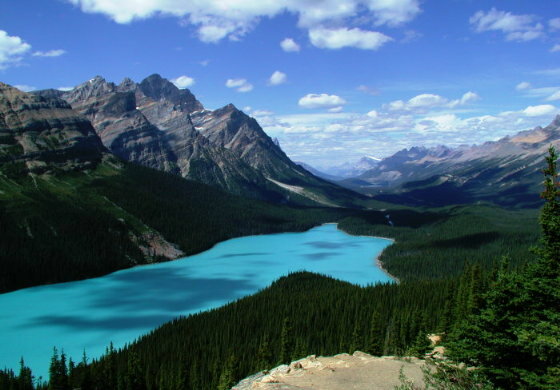 These include Banff National Park, Jasper National Park, Yoho National Park, Glacier National Park, Mt. Revelstoke National Park, and Mt. Robson Provincial Park. HOCKEY NIGHT IN VALEMOUNT – Can you get a more Canadian activity than having a game of pick up hockey surrounded by stunning mountains?! Super Discount at The Paddock – This trip includes an awesome menu with The Paddock Bar & Grill in the heart of Banff. Now THAT’S Canadian! MALIGNE CANYON TREK – Explore this amazing canyon as you cross narrow bridges suspended above the roaring chasm. MOUNT ROYAL HOTEL – A hotel is not a highlight you may say. Wrong! This awesome beauty is right in the centre of Banff with our favourite nightclubs and party spots just a few short steps away. You won’t believe that you are on a budget tour when you check in! AWESOME ACTIVITY PASS – What can we say? It’s awesome! This is the BEST deal going and can say that this deal isn’t offered by anyone else! Warm jacket, hat, gloves (you’ll need these on the Ice Explorer Snowcoach tour. To sign-up for this amazing trip, drop by the INTERNeX Office with your payment of $320.00 (cash only, Canadian dollars). Last day for registration is Friday, July 23, so sign-up quick before all seats are taken! Make the most of your time in the Rockies by participating in some incredible optional activities. Some activities are seasonal and not available on all dates. AWESOME ACTIVITY PASS – Book the Ice Explorer Snowcoach Tour + the Lake Minnewanka Boat Cruise and West Trekl will give you back $3 PLUS throw in the Banff Gondola for FREE! That’s a savings of $32! The Cruise and Snowcoach normally cost $93. BUT, with the West Trek AWESOME ACTIVITY PASS you get The Big Three (The Ice Explorer Snowcoach Tour + the Banff Gondola + the Lake Minnewanka Boat Cruise) all for $90! (That’s like getting PAID $3 to do the Gondola!) – BEST VALUE – STRONGLY RECOMMENDED! To sign- up for this ONCE-IN-A-LIFETIME trip, please drop by the INTERNeX office with your payment in cash. Please bring your passport and contact information with you. For any further information, please contact Laura at pr@internexcanada.com. NO REFUND if you fail to show up at the meeting spot on time.